In my office under the window I keep a used tap (spigot) (pictured). It is a souvenir from my worst DIY project ever. It dates back to the time we lived in Ashwood. The shower tap in the ensuite was leaking so I decided to change the washer. I was so successful and with a spare washer in hand, I decided to also change the (other) hot water washer (which did not need replacing). The second job proved quite challenging as the gap in the tile did not permit removal of the tap. To my horror and disgust I managed to flood the bathroom as I could not properly tighten the tap once it had become loose. This required that I remove and replace the wall behind the shower which had become sodden. I kept the tap as a reminder never to “fix” anything that isn’t broken. Things aren’t always as bad as they seem …… except in DIY projects. I consider myself an optimist. I believe that often times we worry about things needlessly. In the end it is never as bad as we anticipate. Generally speaking I keep this advice to myself. People about to embark on a nervous venture or attend an important meeting don’t appreciate being told not to worry. But every rule has an exception. DIY projects are fun and challenging but if you are not careful they can bring disappointment. After my leaky tap experience I have always approached them with extreme caution. Always, except for yesterday ….. The scene is Australia Day 2016. The weather is fine. The mission is to oil our back deck. The deck is only a year old so the plan is to coat it with a clear finish. 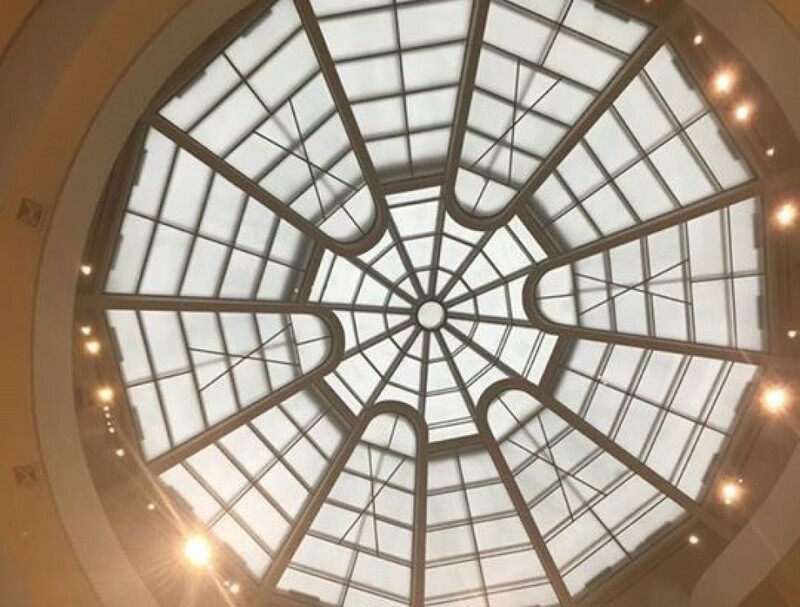 I have worked on decks before and thought this job was well within my ability. In fact, I planned to clean and apply two coats before day’s end. 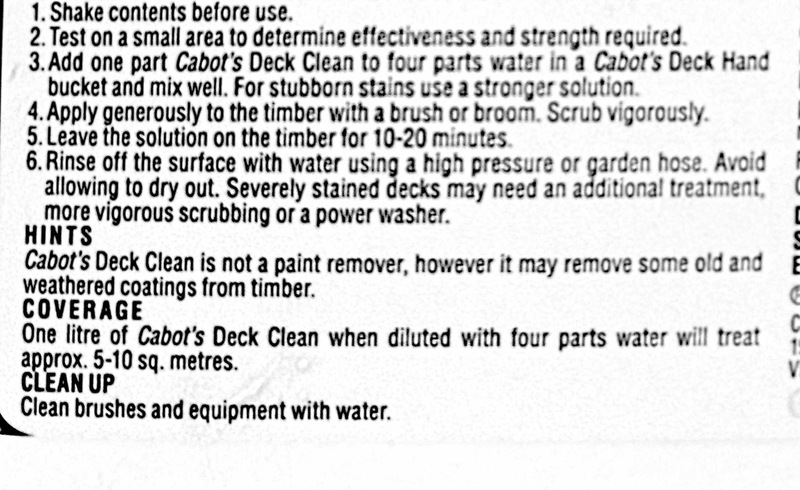 I bought a cleaning solution I had seen advertised called Cabots Deck Clean. I checked the instructions to learn the correct mix and proceeded to mix it and scrub the deck with it. I allowed it almost three hours to dry while I went finishing my (successful) work of oiling the garden furniture. The clear finish I proposed to use was Feast & Watson’s Wet Look. I had used it to great effect on the decks at Camberwell and I was in fact excited by what I thought would be a great result on a relatively new deck. I started with the paint brush, cutting in the difficult corners. Almost immediately I noticed that things were not quite right. The finish refused to adhere to the timber and began to”pill” and clog the brush. Remember I am an optimist. Rather than stop and investigate, I ploughed on and on and on until the entire deck was “covered”. It was hard work as the finish would not apply easily and the woollen applicator became clogged and stiff. At this point I began to question my “cleaning” of the deck. I had used the finish before and had no problem. It looked the same as on previous occasions but the cleaning solution was new. I read the instructions and to my horror and disgust (sound familiar?) I learned that I had not properly applied the solution or at least washed it off, after applying it. I have extracted the instructions below. It’s not easy to have a deck look worse after you had tried to improve it but I had managed to do just that. I spent the rest of the day hose and scrubbing brush (and scraper) in hand trying to remove my work. In addition I noticed the cleaning solution which I originally splashed on the deck had removed the colour from the adjoining render. More work….. I will remember to read the instructions next time and this blog will be my souvenir of my second worst DIY project. How many times have I advised clients against projects that begin badly. I counsel them to refer them to other colleagues or to get assistance or to drop the project altogether while there is still time. Yet here I was doing the exact opposite. I should have read the signs and called a pause early in proceedings when things did not look right. Instead I was determined to get two coats down before the end of the day. Pig headed more than optimistic. I hope my pain is your saviour.